Robert Harrop has the distinction of producing the largest number of individual Trumptonalia items. And,in a merchandising sense, I think it's fair to say that they practically carried the brand almost single-handedly from 1998 to when regular production ceased in 2014. 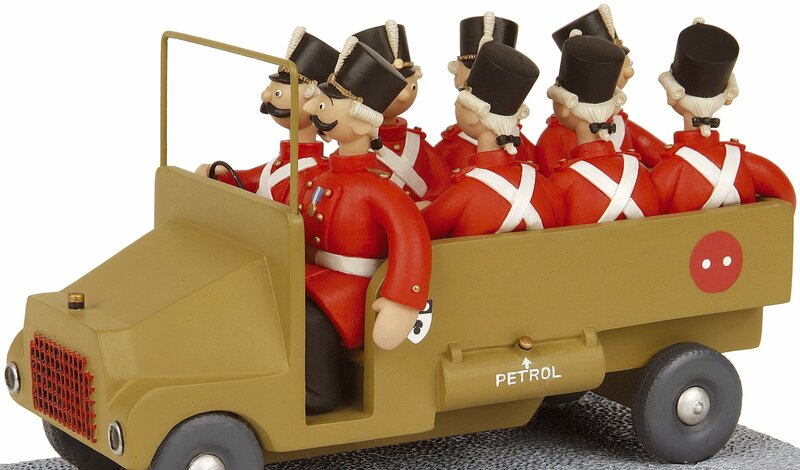 Harrop are a small British company that produce collectable figurines. Either licensed products based on tv shows,or their own in-house creations.And whilst they mainly work in ceramics, they've also used pewter and cold cast bronze. 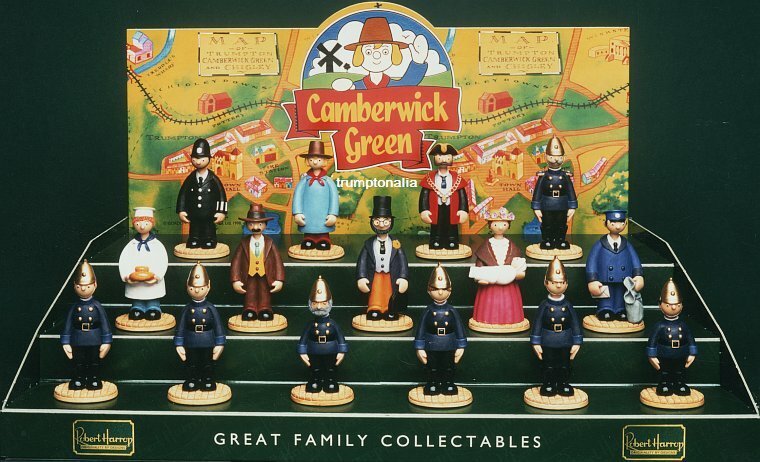 The photo shows the first 15 Trumptonshire figures they produced in February 1998. A mix of Camberwick and Trumpton,with Windy predictably being "001". Since when they've rolled-out statically-posed portraits for every character in all 3 series.As well as modelling most of them again in countless situations and poses from specific episodes.Not forgetting all the buildings and vehicles,musical versions,a monocrome series to reflect the original broadcasts in black & white.All the characters from the Quaker Oats ad.And even special excursions outside the world of ceramics with examples made of bronze and pewter. 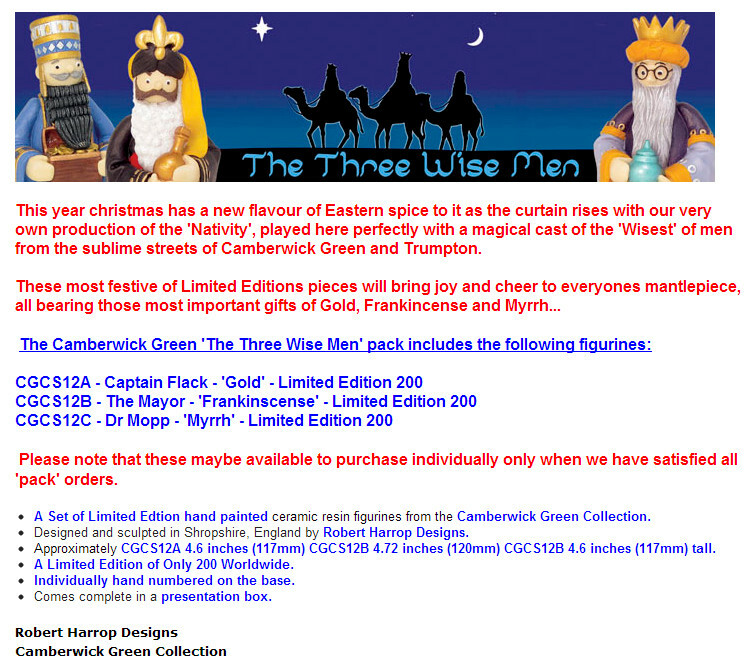 All of which demonstrates just what a fantastic merchandising concept Trumptonshire is of course. But everything has its limits,and there's a finite number of times you can keep going to Windy's well before it runs dry. And the curtain was finally brought down on regular production in 2014. Although isolated one-off specials still haven't been ruled out in future. I confess that if it were my franchise (dream on) and the mortgage had long since been paid (ditto),then I'd probably have put stricter limits on what Harrops could produce. Because you knew the jam was clearly being spread too thin when the justification for the umpteenth different version of Windy was that he scratched his bum 1 minute 34 seconds into episode 5. Too harsh ? Sadly not. Admittedly it's hard to say exactly what harm it did,other than tweeking the sensibilities of someone like me who'd never even bought one. Because they attracted a very loyal following.No-one can question the standard of finish and attention to detail, which was second-to-none.And they've helped to prop up what's left of the British ceramics industry,nevermind the retail outlets they supply. All of which means it's probably churlish to even raise the subject. But I just get a bit whistful when I think of all the much-loved things that have simply been flogged to death over the years.And if I was a completeist Robert Harrop collector I'd personally have felt that many of the releases were a bit like a casino installing slot machines in its' hotel rooms ...... ie.you know they're taking the mickey,but you just can't stop yourself filling it full of cash -even though no-one's actually putting a gun to your head to do it. But maybe I'm still too traumatised by my mother's love of ornaments to be completely dispassionate. So,while I go off for some more counselling,why not pop along to their website and check out their current stuff. Because they produce figures for other kid's favourite,as well as their own creations. And,despite my own personal views about the Camberwick range,any quality British manufacturer deserves our support wherever possible.Which is something I hope we can all agree on. Your browser may well automatically reduce it's size so make sure you enlarge it to get the full effect. And my sincere thanks to Robert Harrop for both the pics on this page.